One of my decorating mottos is, "one can never have too many shelves," and it has evolved over the course of home ownership. One of our first home improvements was adding custom shelves to a recessed window, and my infatuation with horizontal wood at predicable distances apart has not faded...almost the opposite! He's a shot of the "during" phase. 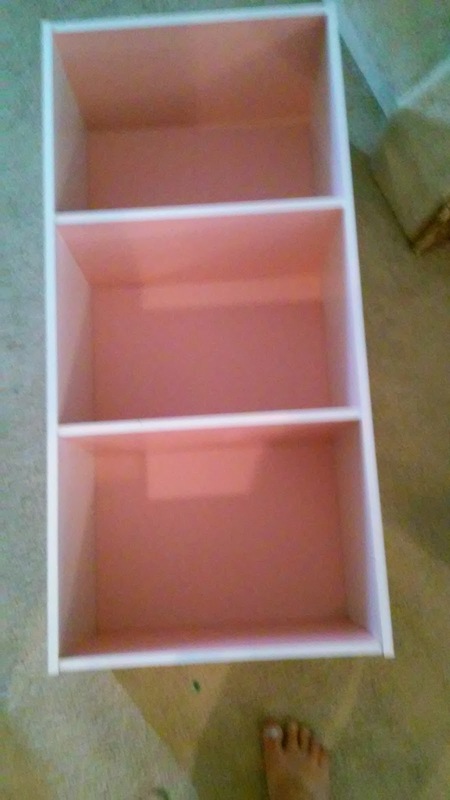 Each shelf took 1&1/4 pages of large scrapbook paper. First they were Mod Podged on, allowed to cure for 24 hours (aka the-kids-came-home-from-school-and-chaos-ensued-and-it-was-nearly-24-hours-until-I-was-alone-again-to-finish-the-project), then Mod Podged over to seal it. That is my son standing to the right of the box. He truly loves green, of any shade. And that is the outfit he chose to wear to school. Fashion advice from a five year old: all shades of a color match. Texted this image to my husband, his reply was, "Wow, that's a lot of green." 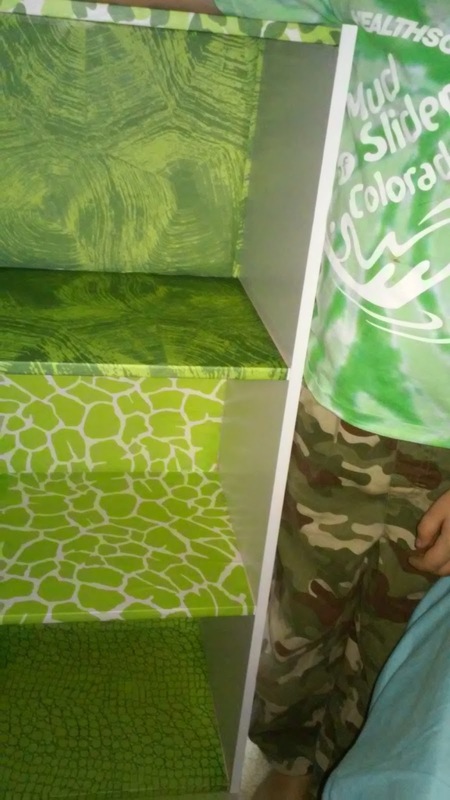 After the shelf was placed in his closest he shut the door and stayed there for over half an hour. Totally thought he'd fallen asleep, it is rare for him to be quiet and still, very rare. 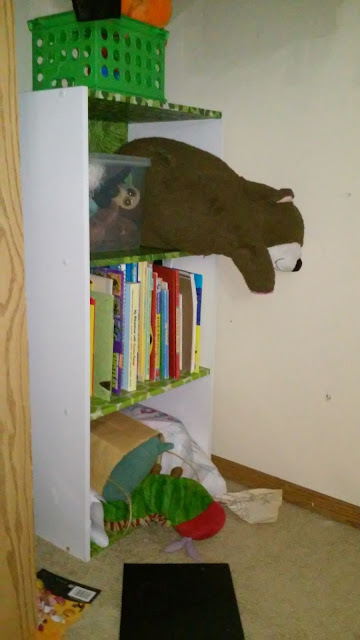 Instead he was busy organizing his books, library style, with the spine outwards, and arranging his treasured stuffies. This kid LOVES his stuffies. 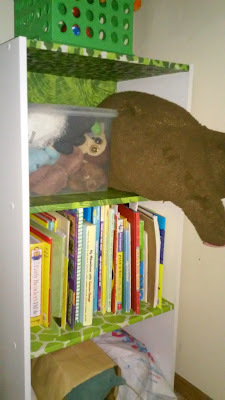 Later he arranged his stuffies as guards to protect his wallet, which was safely tucked into the top box. That poor monkey stuffed in the box. His sad bulging eyes pleading, "Let me out!" 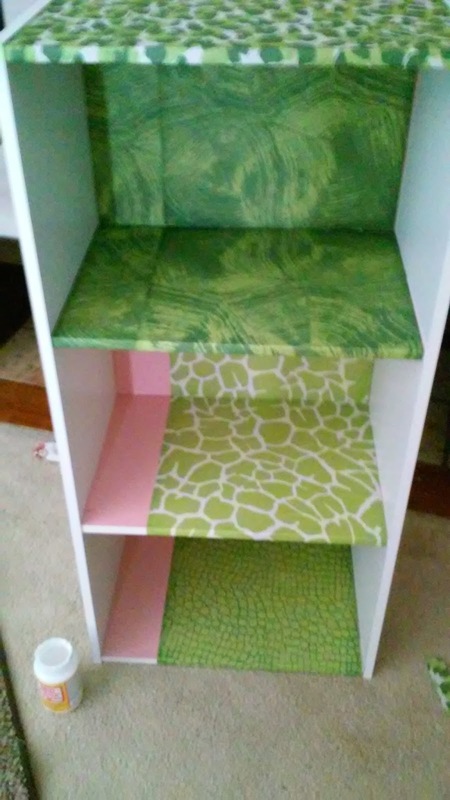 These green zoo print shelves round out his already "wild animal" decor. 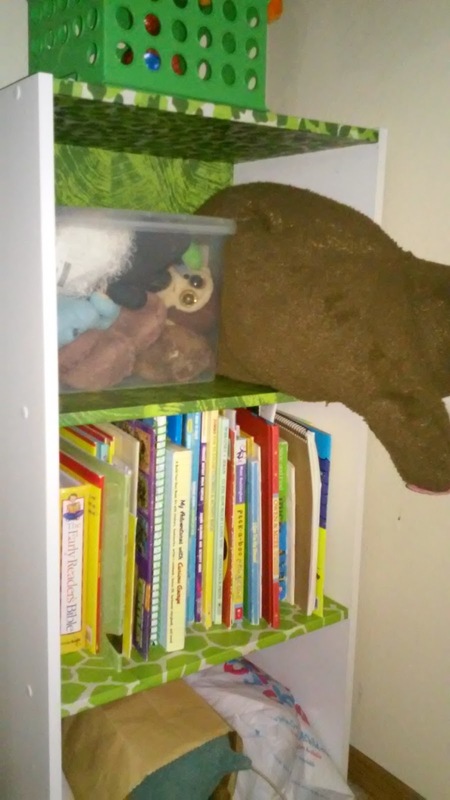 Click on the links below to see posts related to his room. And just about every version of zoo animal clings found on clearance are stuck on these walls. He gets to move them around as he wishes. We have some very creative zoo scenes involving flying monkeys, hippos, and giraffes. Such an active imagination! Very cute!! I love how they turned out and the kids must love them.